All our candy is made of the freshest ingredients. Using a special blend of caramel and the finest chocolates. 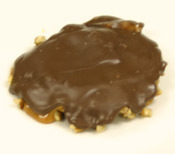 Each turtle consists of a generous layer of fresh Geeorgia pecans, cashews or peanuts covered with a tasty layer of caramel and finally the whole turtle is covered with a special blend of milk chocolate. They average 4 inches in diameter, thus the name, Big Turtles or BATs. 3 BATs approximately 4" in diameter. 6 BATs approximately 4" in diameter. 12 BATs approximately 4" in diameter. Note: Please make selections from above choices until you have 12 BATs. Please allow 7 - 10 days for delivery by US Postal Service. Return Policy: You have 30 days to return undamaged products for a full refund. Copyright © 2011. Divine Decadents. All Rights Reserved.